This article was published in +977 (a Nepalese Lifestyle Magazine in Australia) in Nov/Dec 2014 issue. When I opened my eyes, it was dark and I was in a bedroom but not in my own bedroom. I couldn’t keep my eyes open because there was light coming from the side of the blinds. It was not much light but for some reason my eyes seemed not to like any light at all. I felt nausea and my head was spinning. I felt weak and I couldn’t move my body. I didn’t know what had happened so I screamed and even my scream was weak. Suddenly a man came running to the room and asked,” Are you OK?”. For a second I couldn’t recognised the man but as he came closer I could see his face. It was my husband. Once he came closer, all I did was hug him and cry. After I calmed down and gained my composure, I remembered what was happening. My headache was getting worse but I was not panicking as I was sleeping in our guest room. I was not in the main bedroom as it was too bright and my husband thought I would sleep better in a dark room. The day before I came home early from work because I had a very bad headache and I couldn’t stand to look at the computer screen. When I closed my eyes for a while, I felt better but when I opened them again, the headache was back. I work on a computer so there was no point in staying at work any longer. I went straight home. It was getting difficult to drive but somehow I managed and reached home. I took two Panadols and went straight to bed and slept. After 3 hours when I woke up, my headache had worsened. I felt like my head was going to explode so I decided to go to my local GP. I had to wait for 30 minutes before I could see him and it was the longest 30 minutes of my life. Finally, I told the GP what had happened and expected him to perform a miracle so that my gruesome headache would disappear. Over the years, I have had lots of headaches but this one was supersized compare to what I had before. The GP told me that I have a severe case of migraine and the best solution is to take medication and sleep. Following his advice, I took the medicine he prescribed and went to bed. By the time my husband came home, I was so sick that I was crying. He looked after me for the rest of the evening and I was glad it was night, as I didn’t have to worry about the light. And I was hoping the next morning when I wake up, there would be no headache and I would be able to go to work as normal. But to my dismay, I work up with a stronger headache and I couldn’t open my eyes again. My husband had to take time off from work to look after me as I was not able to get out of the bed. When we talked to GP regarding about my condition, all he could suggest is to keep taking medicine and rest like the day before. Even with a whole day in bed, I was nowhere near better. I couldn’t open my eyes long enough to talk to my husband or watch TV or do anything else. All I could do was lie on the bed and wish I was doing something more productive. The next morning I was more hopeful and was so happy when there was no headache when I woke up. Hubby had to go to work so I was contemplating if I should go to work as well or just rest. However, it took only 10 minutes for my headache to answer all my questions. Even though the headache was not as bad as the previous days and I was not in severe pain, I couldn’t think straight and for sure was going to be useless for the rest of the day again. Whenever I could and my eye permitted, I Googled many times to find a cure for my migraine but my effort was in vain, as everyone suggested staying in a dark room with eyes closed and it would be all good. My question was how long I could stay indoors like that. Being a very active person, it was impossible for my mind to shut down but my body needed the rest. One of the websites suggested lying down and putting an ice pack or cold compress on my head and it did help with the pain but it was just reducing the pain, not curing it and I really was looking for cure. Even though I tried my best, I couldn’t sleep the whole day and I was very glad when hubby was home after work. At least when he is around me I have someone to talk to. It took full 6 days to get rid of the headache. It was not sever most of the time but I was constantly in pain. First time, in my life I felt the severe pain and realised how worst pain can go. I am praying that it will never happen again and I will never want to be prisoner of darkness again. 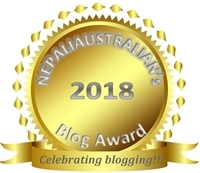 This entry was posted in Published and tagged +977, +977 magazine, +977 Nepalese Australian magazine, a Nepalese Lifestyle Magazine in Australia, Australia, nepali australian, Nepaliaustralian, plus977. Bookmark the permalink.